You know how much we love games. 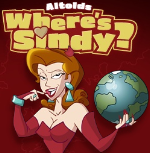 Find Altoids' Sindy in a game built right into Google Earth. We were never superkeen on Carmen Sandiego, but Sindy probably won't have trouble inspiring a chase. Nice to see Altoids is over its frightening identity crisis. We salute you, Hal Riney WDDG (oops, sorry about that, guys). Looks cool, but it doesn't work on my mac with firefox. This game was actually created by the geeks at WDDG. yeah, wont' run on safari either. no mac support? how 1995 is that?